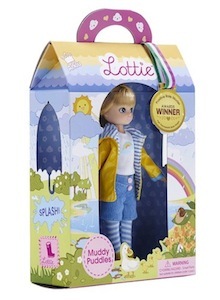 Lottie loves the sound of the squelch of her boots in the mud, and it is great fun to find the deepest, muddiest puddle and jump up and down. Muddy Puddles is prepared for the rainy weather in New Zealand in her rain boots and yellow hooded raincoat with blue striped lining. Underneath she wears a long sleeved t-shirt, corduroy shorts and striped leggings.